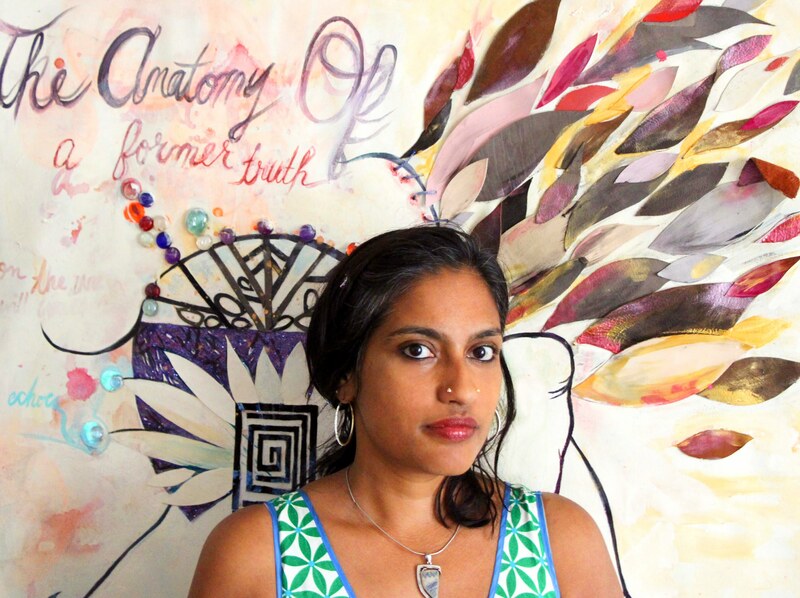 Chitra Ganesh is a Brooklyn based artist whose drawing, installation, text-based work, and collaborations suggest and excavate buried narratives typically absent from official canons of history, literature, and art. Ganesh graduated from Brown University with a BA in Comparative Literature and Art-Semiotics, and received her MFA from Columbia University in 2002. She has held residencies at the Lower Manhattan Cultural Council, New York University, Headlands Center for the Arts, Smack Mellon Studios, and the Skowhegan School of Painting and Sculpture, among others. Her works have been widely exhibited across the United States including at the Queens Museum, Asia Society(New York), Berkeley Art Museum, Museum of Contemporary Art San Diego (California), and the Contemporary Arts Museum in Houston, with solo presentations at PS1/MOMA (New York), The Andy Warhol museum (Pittsburgh) and Goteborgs Konsthalle (Sweden). International exhibition venues include MOCA (Shanghai), Fondazione Sandretto (Italy), Monte Hermoso (Spain), Kunsthalle Exnergrasse (Austria), Kunstverein GÃ¶ttingen (Germany), and the Gwangju Contemporary Arts Centre (Korea). Her works are represented in prominent international collections such as the Museum of Modern Art, Philadelphia Museum of Art, San Jose Museum of Art, Baltimore Museum of Art, the Saatchi Collection (London), Burger Collection (Zurich) & Devi Art Foundation (New Delhi). Ganesh is the recipient numerous awards and fellowships including the Art Matters Foundation, the Joan Mitchell Foundation for Painting and Sculpture, and a 2012 John Simon Guggenheim Memorial Foundation Fellowship in the Creative Arts. Upcoming solo exhibitions include a site-specific commission at the Brooklyn Museum opening in December 2014. 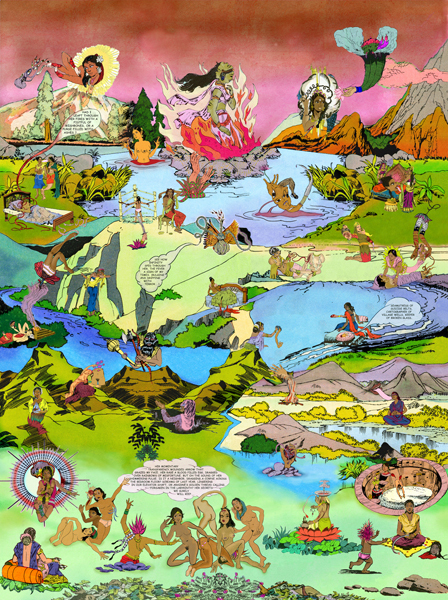 Chitra Ganesh is the third exhibition in The Word of God series, which examines and contextualizes world legions and their texts through contemporary art. Chitra Ganeshâ€™s artwork combines different visual languages, cannons and cultures, including comic books, Bollywood cinema and iconic goddesses from Hindu folklore. Ganesh creates cross-cultural narratives about sexuality and power that may sit in comic book frames where interior thoughts are revealed in bubbles or --as in her wall installations-- hover in psychedelic space with three-dimensional elements that protrude into contemporary reality. This exhibition includes artworks based on the comic, Amar Chitra Katha, which Ganesh read as a young person and that is still in print today. The enormously popular comic (over 90 million printed) began in the 1960s to teach children in India and the Diaspora; about South Asian myths, history and culture; as well as to teach children proper behavior through specific characters. Tales of Amnesia, 2002â€“2007, is also displayed in a vitrine in this show. 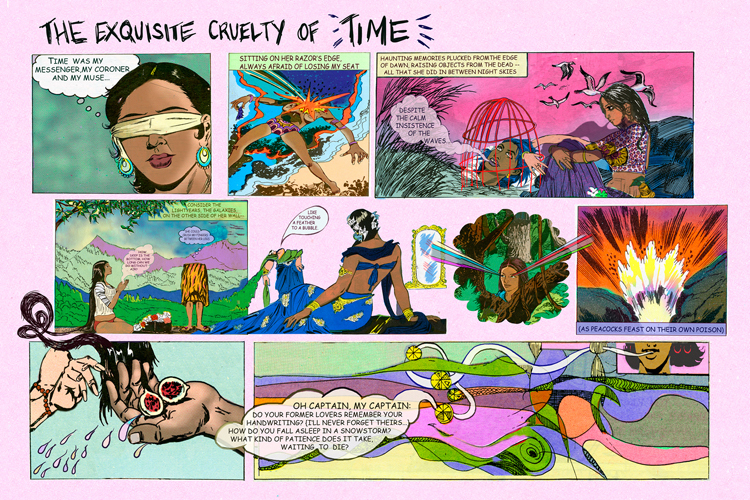 The museum has made copies of it for visitors to peruse in order to contextualize Eyes of Time with zines and comics that focus on the intersection of ancient myth and popular science fiction, which is a critical aspect of my practice. There will be some programming around the exhibition, and the Brooklyn Museum will also be screening a few of the films Iâ€™ve made, such as the collaboration I did with Simone Leigh as well as an animation. Iâ€™m also hoping to have a dance party as one of my public events. Coincidentally, in the â€™90s there was even a queer club in London called Club Kali.